On any given weekday afternoon, New York’s reception desk looks more like a conveyor belt for delivery bags from Maple. As soon as someone grabs one of the orders — meticulously IDed and adorned with cloth handles, like luxurious presents — it doesn’t take long before a new delivery person drops off additional orders. The service is, of course, wildly popular in many offices (and homes) in the parts of lower Manhattan that are in its delivery zone. But with the news that Maple will now expand its reach to midtown — perhaps the biggest lunch market in the city — the company is poised to become the city’s preeminent food-delivery option, thanks to a business model that’s predicated on the idea of simplicity, and the company’s ability to oversee every single part of the delivery experience, from start to finish. Co-founders Caleb Merkl and Akshay Navle launched Maple in April, with the help of one important backer: Momofuku’s David Chang, who says he signed on because “no one’s ever taken the time to really do delivery food well.” And the clearest reason for Maple’s rapid success is that the food tastes really good: New York’s Underground Gourmet called the vegetable-heavy options “perfectly cooked” and “deftly constructed” — words you rarely, if ever, hear when talking about delivery. And unlike delivery apps that connect customers with restaurants, Maple can take full credit for this: Everything is prepped in a commissary kitchen in Brooklyn, and then in a network of neighborhood delivery-kitchen hubs. 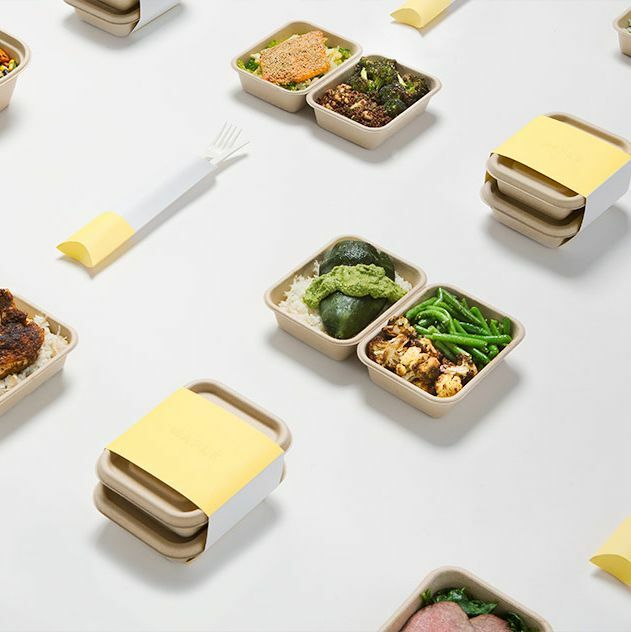 Meals are conceived and packaged to withstand a commute — which customers can track in real time — and they often arrive in 30 minutes or fewer. Lunch costs $12, dinner is $15, and tax and gratuity are included, so there’s no guilt over tipping, even if you live on a sixth-floor walk-up and it’s pouring rain. Actually, Maple’s delivery staffers are full-time employees who are paid $14 per hour, with health care. After executive chef Soa Davies, a Le Bernardin veteran, conceives each dish, it undergoes a 50-step “stress-testing” process to ensure that it travels well. An in-house team then professionally photographs it, and Maple staffers carefully analyze which day to put it on the menu. “The menu mix is a really difficult thing to nail,” Merkl says. “The reality is the mix that will perform well on a Monday is very different from the mix that will perform well on a Friday. People enter the week wanting to make smart decisions, so we offer a much healthier skew.” Nutritional information will soon become available, and Maple is planning on launching a blog to spotlight where it consciously sources its ingredients. This push for transparency is smart, especially at a time when 10 percent of the top restaurants on competitor GrubHub Seamless are so-called “ghosts,” with business names that don’t even match the food’s actual point of origin. It helps that the food tends to arrive fully intact — no leaks or errant globs of sauce — in its attractive, compostable packaging that keeps everything looking more or less like the pro shot users see on the site. (The team also chose compostable sugarcane packaging because it responds best to heat, so food actually arrives warm.) “We knew we were going to be losing plating, which is something that you don’t necessarily think about when you’re in a restaurant, but it’s actually a really big component of how you perceive the meal,” Merkl says. Even still, the company recognizes its current limitations. Right now there are 40 people working at Maple HQ, and most of the company’s growth is coming from the culinary and delivery sides. As the company slowly expands its delivery areas, the goal is to serve all of Manhattan. On a grander scale, Merkl envisions this model as one that could work in “pretty much every city.” But there’s no set timeline in place, and there are still many kinks to be worked out: Maple has trouble predicting demand and often sells out of dishes. Like any good start-up, though, the customer service is excellent. After inquiring about a recent order that took over 30 minutes to arrive, a real human emailed to apologize, twice. When the missing food — a hake entrée — did arrive, it was indeed perfectly cooked.